just a bit of hyperbole here and there to make the case. My wife is a good cook. I don’t want to insult her by asking God to make her meals fit to eat. The point is that saying these things makes it almost appear that we view food as hazardous to our health until God rearranges the atomic particles. It seems to me that this kind of prayer is a little offensive to the cook. (“Please make this horribly degenerate, polluted, tainted stuff fit to eat.”) My wife is a good cook and works hard in the kitchen. I don’t want to insult her by asking God to make her meals fit to eat. Now, don’t get me wrong. I’m one who is very concerned about what goes in my mouth, especially since reaching the prune-eating stage of life. Many of us experience numerous health problems, often caused by years of poor diet. It would be nice if God made all of our food nutritious, if we could eat fries and get the nourishment of veggies. poke into our mouths? Those Twinkies don’t turn into carrot juice. their mouths and set them on fire? Who knows? Maybe some do. Kings 4:38-41. In this case the chow was so toxic that the diners would have died on the spot if God hadn’t intervened. purify and cleanse food. He simply expressed thanks to him. Romans 14:6 speaks of giving God thanks for food, and 1 Timothy 4:3 speaks of receiving food with thanksgiving. It seems to me that we should focus more on giving thanks and praise to the One who supplies all our needs, and less on asking him to perform miracles before we eat. If I die of food poisoning you’ll know I made a mistake. to be grateful for. 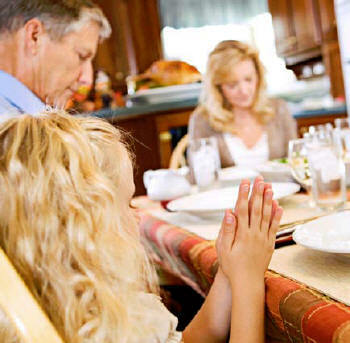 As recipients of God’s generosity, we can give abundant thanks for the food our Father so graciously provides.